The Irish National Sprint Championships, Scheduled for August 12th in Lough Rynn. Due to a busy Summer racing schedule both locally and Internationally in all Canoeing disciplines, we are postponing to a later date. 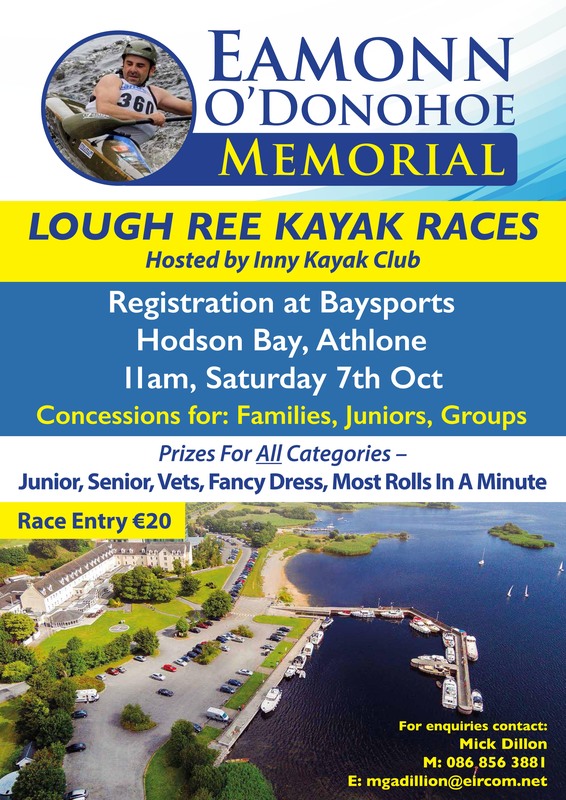 We are proposing Saturday 30th September 2017 in Lough Rynn, The weekend after the Liffey Descent. Confirmation to follow. If you aren’t racing on the day and are available we would welcome volunteers to help. We wish our Athletes the Very Best of Luck at the upcoming World Championships in Pau. You will see that they are also hosting the WWR championships at the same time! Please find updated provisional results separated by category. To see the provisional results for the 58th International Liffey Descent go to Sports Timing Results. The Crayfish plague is now on the Barrow from Royal oak. It will only spread downstream of the location of infection. For people operating on the Barrow, stick to you local area and if you have to move gear and boats, wash and dry for at least 48 hours before going to another water course. Inspect watercraft (inside and out) and other gear. Remove and safely dispose of all attached plant and animal material, mud or debris. Rinse and disinfect all gear thoroughly this should be followed by a 24 hour drying period. Milton can be used as a disinfectant, either make a solution or a spray. Or by washing gear in water over 40 degrees. Disinfecting kayaks/canoes/paddles with (Virkon / Milton Solution or power hose with hot water over 40 degrees Celsius this should be followed by a 48 hour drying period.